The final three seasons of Coppi’s life, between 1957 and 1959, saw his inevitable decline. He remained a living legend, but as the champion’s power fade away, he wasn’t winning big races any more. In 1959, Coppi returned to his own team on his own bikes: Tricofilina-Coppi. 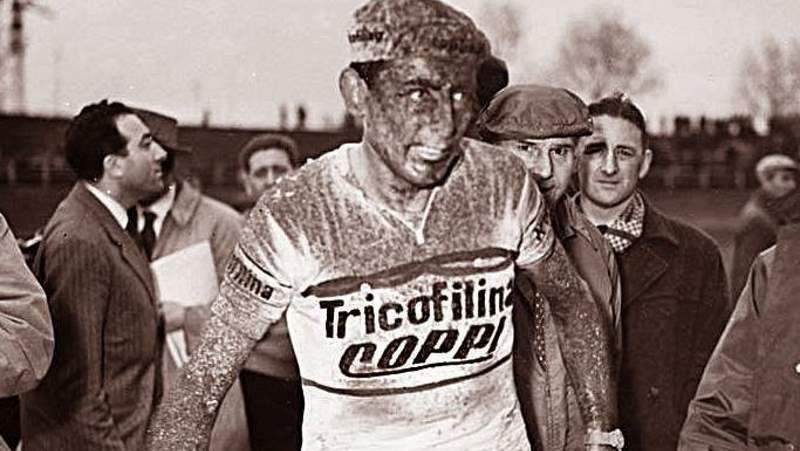 Fausto Coppi after Paris-Roubaix 1959 edition, covered with mud. 1959 Paris-Roubaix, the 57th edition of the “Queen of the Classics”, was held on Sunday, April 12. It was raining heavily. By the time the peloton reached Amiens, seven strong men attacked from the pack. They were being chased by an elite group that included Roger Rivière, Rik van Looy and Alfred de Bruyne. Because of the rain and the slippery cobblestones, a motorcycle crashed in the chasing group and took some of the chasers out. Meanwhile, some riders had dropped from the breakaway group and only the last three men, Noël Foré, Gilbert Desmet and Marcel Janssens fought for the victory. 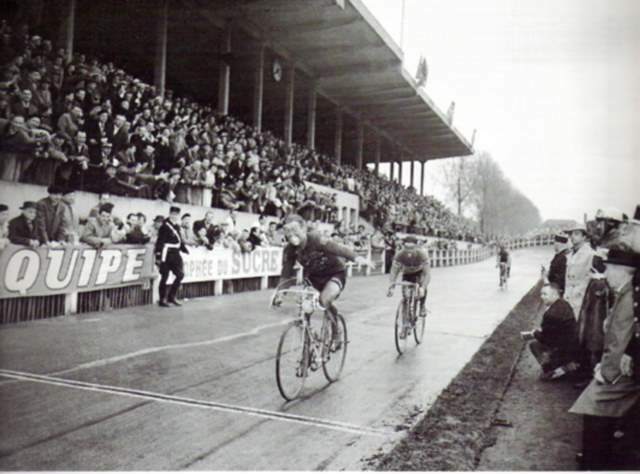 Foré was the fastest in the Roubaix velodrome and won by two lengths. 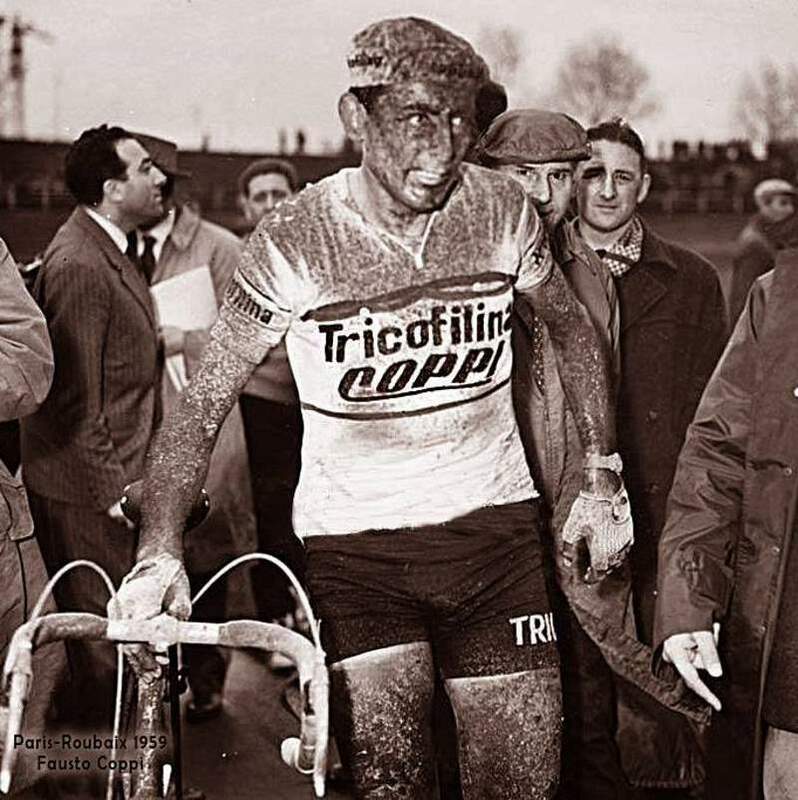 Despite the heavy rain, the 1959 edition was the 13th fastest Paris-Roubaix edition in history, with the average speed of 42.760 kph (26.569 mph). And Coppi? He fought desperately only to finish in 44th place, 7min 35sec behind the winner.